Sidney Gavignet (FRA) and Damian Foxall (IRL) on the MOD70 Oman Air – Musandam crossed the finish line of the Transat Jacques Vabre finish line off Itajai, Brasil at 20h 04m 09 sec local time (22h 04m 09 secs) 5 hrs and 15 seconds after the winner Edmond de Rothschild (Sébastien Josse and Charles Caudrelier). The duo took 11 days 10 hours 04mins and 09 seconds to complete the 5,450 miles (theoretical course) between Le Havre and Itajaí, at an average speed of 19.71 kts. They actually sailed 5968 miles at an average of 21.77 knots. This transatlantic race for the MOD70s was characterised by a fast, relatively testing exit of the English Channel followed after the Bay of Biscay by a difficult passage of Cape Finisterre in big seas and building winds – which skipper Gavignet later described as the worst he had seen on a MOD70 –before escaping into the Portuguese Trade Winds allowed an initial break by Edmond de Rothschild. 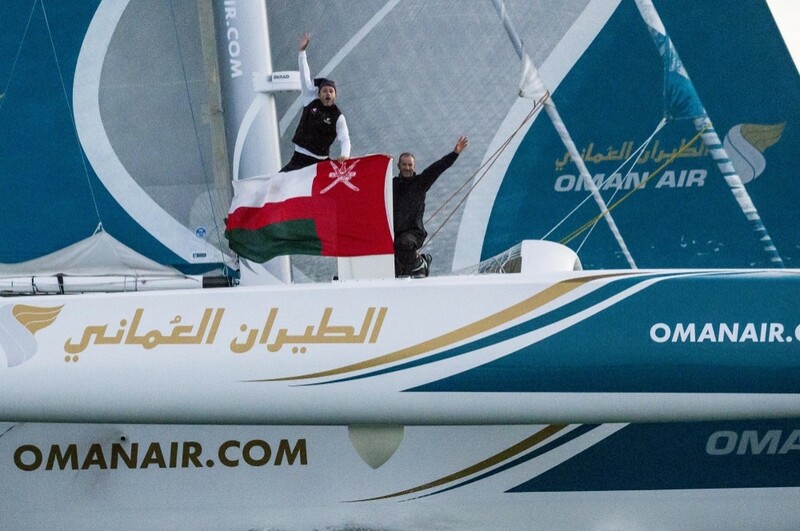 The two MOD70s closed up after the Doldrums and Oman Air – Musandam were less than 30 miles behind on Saturday night before they dropped off the back of the cold front there. “I think that we made a few mistakes but Edmond de Rothschild made less. The most important thing for us when we finish an event like this is to say we have no regrets, and we have small sporting regrets, a couple of things we could have done a little bit better, but we crossed the finish line and feel very happy with the two weeks we have been at sea, Edmond de Rothschild deserved the win. "It would have been nice to have been a little bit closer but we dropped off the back after coming out of the cold front off Cabo Frio, and we had a few little technical things which slowed us down, but to be in is awesome. I guess going around Finisterre we kind of overestimated the conditions, we maybe went a little bit into defensive mode, thinking long term, whereas we really needed to be pushing on then to stay with the strategic game, to go in the right direction and to get south fast. "The further south you got, the faster you got there and that was right through into the following week. We dropped off the back of it there a bit. And the other tough moments were putting a lot of work into getting back up to the other guys and I think we were up to 20 miles behind and then we lost the hydraulics and the rake on the rig. "That was about 36 hours ago. One moment that was pretty tough as well was when the port autopilot failed, the display on the helm, and so when the guy was helming on port, the other guy could not sleep, you stayed in the cuddy and every time you needed to trim, you had to call the other guy and so when you were off, you were not off. "There were difficult periods, we realised after the third of fourth day when we started to recover, really how much we had put in over the first couple of days, it does not take much to throw you out of your watch schedule, you don’t realise that you are digging into the reserves a bit. "Obviously one of the objectives was to arrive here in good shape, we have managed to do that and now we are ready for Brazil. The main objective was get here in good shape and if we did that it means we managed the machine well. “In sport you have a spectacle and these boats certainly give you that. They are exceptional. When we arrived we had brilliant weather and just wanted to carry on sailing, they are just brilliant racing machines and I hope that there will be more next time. Meanwhile the two leading Multi 50s continue their duel down the Brazilian coast in steady E’ly trade winds on what is presently just a straightforward head to head boatspeed contest. They have no real strategic options ahead until Cabo Frio at the entrance to the Bay of Rio. They should pass the entrance to Salvador de Bahia today in just a little over 12 days which will stand up well against the 2005 mark set by Franck Yves Escoffier of 12 days and 6 hours 14 minutes. FenêtréA Cardinal (Le Roux-Elies) and Actual (Le Blévec-de Pavant) remain in close contact with some 25 miles separating this closely matched leading duo. It is one long straight for the IMOCA Open 60 monohulls, the leaders having crossed the Equator last night. Just as the feedback from the pre-race training sessions for the Famous Five at Port La Foret indicated, it seems MACIF find a sweet spot at times and are simply quicker. From being a matter of half a mile to a mile away from PRB (Riou-Le Cam) yesterday Francois Gabart and Michel Desjoyeaux have been able to climb steadily away in the trade winds, opening the gap to over 12 miles this morning, the Vendée Globe winning duo sailing almost a knot faster than Riou and Le Cam as they passed the Fernando de Noronha island group. Presently they are just around one day behind the leading Multi 50s. As their SEly trade winds back E then they should accelerate still further away from the boats behind them. Italian Vendée Globe skipper Alessandro de Benedetto was on typically excellent form when he spoke to Race HQ in Itajaí from his trusty Team Plastique. He and his co-skipper Alberto de Monaco are enjoying their race against their friends on Energa and Initiative Coeur. In Class 40 Jorg Riechers and Pierre Brasseur on second placed Mare are waiting for the Doldrums for their chance to pounce on long time leaders GDF SUEZ, sailed by Sébastien Rogues and Fabien Delahaye. “Everything is good on board, we are in good shape and the wind is building, we should catch up some miles on GDF SUEZ soon. I still have some pain in my back with the bruising I got when I fell during the first night out from Roscoff. It will pass.” Riechers said today.